The RD-300NX is a lightweight digital piano with a full keyboard featuring the Ivory Feel-G texture and touch. The sound mechanism derives from the series’ SuperNATURAL engine that provides a realistic experience compared to a standard piano. The model remarkably offers hundreds of preset songs and many times as many voices for the best in instrumental expression. The Sound Focus feature allows even the most delicate notes to be heard. Utilized with SuperNATURAL phase-correcting technology, the sound mechanism ensures the sound is rich and full without coloring or compressing its tone. This allows for natural and expressive performances without risking sound quality or dynamics. The improved Ivory Feel-G keyboard implements the company’s most advanced sensor, genuine ivory texture and escapement mechanism. The elegant touch offers the sensitivity of the brand’s standard acoustic pianos only with a lighter more compact design. The keyboard also utilizes Progressive Hammer Action with Escapement, using the same texture, appearance and functions as those on a traditional piano. In contrast to many cheaper digital pianos the Roland RD-300NX offers hundreds of instrument voices built-in to the device. These allow players to use the piano for a greater variety of purposes, when compared to other devices, from recording to live performance. The RD-300NX features the One Touch Piano method that is common among RD-series instruments. This feature offers immediate access to versatile piano and electric piano voices with simple one-touch buttons. The Piano Designer feature is a powerful tool that allows the user to create custom pianos quickly on the unit’s LCD. Lastly, the device offers an optional three-pedal unit for an enhanced and more realistic full piano experience. The Roland RD-300NX is a portable and compact device that is ideal for musicians that must carry their instrument frequently between venues. It offers an impressive touch response due to its Progressive Hammer Action that helps players train finger technique before graduating to an acoustic piano. The RD-300NX is made with a durable steel exterior, making it sturdy enough to withstand many conditions encountered by traveling players. It offers a number of piano voices and instrument sounds to effectively play any piece with style and expression. A drawback to the device is the complication that results from switching voices during live performances. Portable – The keyboard on the RD300-NX is compact and light, making it ideal for musicians that perform and travel on a regular basis. Key Action – The RD-300NX utilizes the key action of Progressive Hammer Action with Escapement that makes it one of the best weighted piano keyboards in its class. This provides a touch like that of an acoustic piano in order to prepare players for development toward an acoustic or to accommodate those that are accustomed to an acoustic. Durable Build – The Roland RD-300NX has a sturdy and solid steel exterior. Many lightweight digital pianos, without the stand, can be made of less sturdy plastic that may be susceptible to chips or cracks under harsher conditions. Versatility – This model offers a true piano sound to give the most impressive of performances. In addition, it offers a large variety of instrument sounds and voices to give enhanced versatility and expression to any performance. Voice Changing – When changing between voices it can be complicated to quickly and easily switch from one to another. Additionally, volume settings do not remain constant when switching between them. This can result in loud shocks of increased volume if sub faders are not adjusted beforehand. Both can be detrimental for live performers. 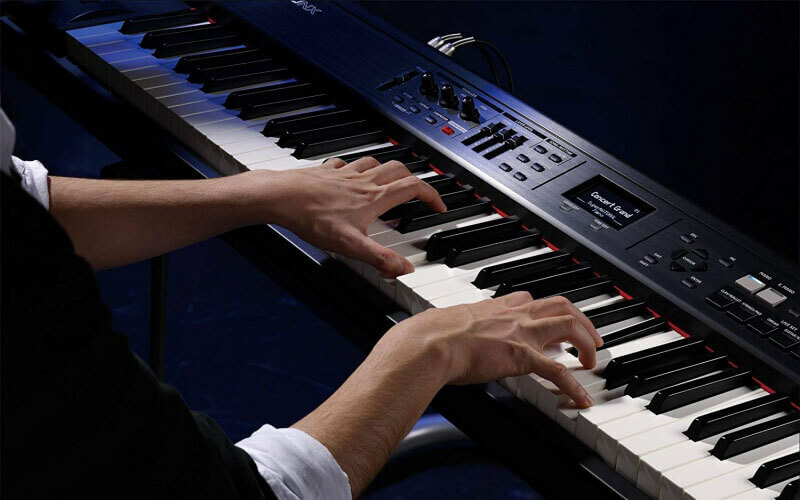 The Roland RD-300NX is a high-quality digital piano that can be considered balanced between ability and simplicity. The player’s sound can be easily customized with piano and other voices for vast tonal variation. While it may have drawbacks for some musicians it is generally a useful tool that allows the player to maintain focus on play. The RD-300NX is versatile and durable and should be thoroughly considered as a traveler’s piano.